2006-04-11 Assigned to PPG INDUSTRIES OHIO, INC. reassignment PPG INDUSTRIES OHIO, INC. ASSIGNMENT OF ASSIGNORS INTEREST (SEE DOCUMENT FOR DETAILS). Assignors: FALER, DENNIS L., POLK, W. DAVID, FERENCZ, JOSEPH M.
Disclosed are powder coating compositions suitable for producing a decorative and durable coating having a homogeneous hue, articles comprising a decorative and durable coating having a homogeneous hue deposited thereon, methods for preparing a decorative and durable coating having a homogeneous hue, kits capable of producing a decorative and durable coating having a homogeneous hue, and methods for color matching using powder coating compositions. The present invention relates to powder coating compositions suitable for producing a decorative and durable coating having a homogeneous hue, articles comprising a decorative and durable coating having a homogeneous hue deposited thereon, methods for preparing a decorative and durable coating having a homogeneous hue, and kits capable of producing a decorative and durable coating having a homogeneous hue. Powder coatings compositions for use in coating various types of substrates are often desired. Such coating compositions can greatly reduce, or even eliminate, the use of organic solvents that are often used in liquid coating compositions. When a powder coating composition is cured by heating, little if any volatile material is driven into the surrounding environment. This is a significant advantage over liquid coating compositions in which organic solvent is volatized into the surrounding atmosphere when the coating composition is cured by heating. Powder coating compositions are typically produced by a complex process that includes dry blending various coating components, such as color pigments, film-forming resins, curing agents, and other additives, such as flow control agents and charge control agents, subjecting the resulting blend to heating, melting and kneading by the use of an extruder or the like, and then subjecting the resulting extrudate to cooling, grinding and classification (referred to herein as the “Extrusion Process”). Thus, the Extrusion Process requires many steps. One disadvantage to the use of powder coating compositions has been that, to obtain various coatings of different hues, the production of a separate powder coating composition for each desired hue has been required. When liquid coating compositions of different hues are mixed, it is possible to obtain a coating having a homogeneous hue that is different from the hue of each mixed liquid coating composition. On the other hand, when typical powder coating compositions of different hues are dry-blended and the resultant blend applied to a substrate, the result is that each hue can be generally distinguished by visual examination with the naked eye, resulting in a “salt and pepper” effect. Thus, it has previously been difficult, if not impossible, to achieve a coating of a desired hue from a dry blend of two or more powder coating compositions of different hues. As a result, it would also be desirable to provide powder coating compositions suitable for producing a decorative and durable coating having a selected homogeneous hue from a dry blend of two or more powder coating compositions each having a different hue. In certain respects, the present invention is directed to powder coating compositions suitable for producing a decorative and durable coating. These coating compositions comprise a mixture of a first powder coating composition having a first hue and a second powder coating composition having a second hue different from the first hue. Moreover, the first powder coating composition and/or the second powder coating composition comprises polymer-enclosed color-imparting particles. The powder coating compositions of the present invention, upon direct application to at least a portion of a substrate and cure, produce a decorative and durable coating having a homogeneous hue different from the first hue and the second hue. In other respects, the present invention is directed to articles comprising a decorative and durable coating having a homogeneous hue deposited thereon. The decorative and durable coating is deposited directly from a powder coating composition comprising a mixture of a first powder coating composition having a first hue and a second powder coating composition having a second hue different from the first hue, wherein the first powder coating composition and/or the second powder coating composition comprises polymer-enclosed color-imparting particles. In the articles of the present invention, the homogeneous hue is different than the first hue and the second hue. In yet other respects, the present invention is directed to methods for preparing a decorative and durable coating having a homogeneous hue. These methods comprise: (a) providing a first powder coating composition having a first hue, (b) providing a second powder coating composition having a second hue different than the first hue, (c) mixing the first powder coating composition and the second powder coating composition, and (d) directly applying the mixture to at least a portion of a substrate. In these methods, the first powder coating composition and/or the second powder coating composition comprises polymer-enclosed color-imparting particles. In still other respects, the present invention is directed to kits comprising: (a) a first container comprising a powder coating composition having a first hue, and (b) a second container comprising a powder coating composition having a second hue different from the first hue. In the kits of the present invention, the first container and/or the second container comprises a powder coating composition comprising polymer-enclosed color-imparting particles, and upon mixture of the contents of the first container with the contents of the second container, a powder coating composition is formed that, upon direct application to at least a portion of a substrate and cure, produces a decorative and durable coating having a homogeneous hue different from the first hue and the second hue. The present invention is also directed to methods for color matching using powder coating compositions. These methods comprise: (a) providing a first powder coating composition having a first hue, (b) providing a second powder coating composition having a second hue different than the first hue, (c) mixing the first powder coating composition and the second powder coating composition in a proportion that results in a coating having a desired homogeneous hue when the mixture is directly applied to at least a portion of a substrate and cured. In these methods, the first powder coating composition and/or the second powder coating composition comprises polymer-enclosed color-imparting particles. For purposes of the following detailed description, it is to be understood that the invention may assume various alternative variations and step sequences, except where expressly specified to the contrary. Moreover, other than in any operating examples, or where otherwise indicated, all numbers expressing, for example, quantities of ingredients used in the specification and claims are to be understood as being modified in all instances by the term “about”. Accordingly, unless indicated to the contrary, the numerical parameters set forth in the following specification and attached claims are approximations that may vary depending upon the desired properties to be obtained by the present invention. At the very least, and not as an attempt to limit the application of the doctrine of equivalents to the scope of the claims, each numerical parameter should at least be construed in light of the number of reported significant digits and by applying ordinary rounding techniques. As previously mentioned, certain embodiments of the present invention are directed to powder coating compositions suitable for producing a decorative and durable coating. As used herein, the term “powder coating composition” refers to a composition suitable for producing a coating on a substrate, which is embodied in a solid particulate form, as opposed to liquid form. As used herein, the term “decorative and durable coating” refers to a coating that is both decorative, i.e., it provides a desired appearance to the substrate, and durable, i.e., it does not significantly chip, peel, mar, or delaminate when subjected to environmental conditions, such as humidity and abrasion typically experienced by a coating, such as coatings used on automotive and truck components, such as bodies, door panels, cabs, trailer bodies; airplane components, such as fuselage and wings; architectural components; consumer electronic equipment, such as computers and telephones; as well as other articles. As a result, the “decorative and durable coatings” of the present invention are distinct from decorative coatings formed from the use of dyes or inks that are not durable. The powder coating compositions of the present invention comprise a mixture of a first powder coating composition having a first hue and a second powder coating composition having a second hue different from the first hue. As used herein, the term “mixture” refers to a heterogeneous association of the first powder coating composition and the second powder coating composition, wherein the powder coating compositions are not chemically combined and can be separated by mechanical means. The first powder coating composition and the second powder coating composition may be mixed by any method, such as, for example, dry-blending methods using high speed agitators, such as a Henchsel mixer. In the present invention, as described herein, by producing powder coating compositions of a limited number of colors (fundamental colors) and by examining, in advance, the relation between the proportions of these colored powder coating compositions and the hues of the coatings obtained therefrom, a powder coating composition of virtually any desired hue can be produced by appropriately selecting the colored powder coating compositions and mixing them in the proper proportion so as to give as desired homogeneous coating hue without the need to subject the mixture to the Extrusion Process. As previously indicated, the first powder coating composition and/or the second powder coating composition comprises polymer-enclosed color-imparting particles. In certain embodiments, the first powder coating composition and the second powder coating composition both comprise polymer-enclosed color-imparting particles. As used herein, the term “polymer-enclosed particles” refers to particles that are at least partially enclosed by, i.e., confined within, a polymer to an extent sufficient to separate particles from each other within the resulting coating, such that significant agglomeration of the particles is prevented. It will be appreciated, of course, that a powder coating composition comprising such “polymer-enclosed particles” may also include particles that are not polymer-enclosed particles. As used herein, the term “color-imparting particle” refers to a particle that significantly absorbs some wavelengths of visible light, that is, wavelengths ranging from 400 to 700 nm, more than it absorbs other wavelengths in the visible region. In certain embodiments, the particles that are enclosed by a polymer comprise nanoparticles. As used herein, the term “nanoparticles” refers to particles that have an average particle size of less than 1 micron. In certain embodiments, the nanoparticles used in the present invention have an average particle size of 300 nanometers or less, such as 200 nanometers or less, or, in some cases, 100 nanometers or less. Thus, in certain embodiments, the powder coating compositions comprise color-imparting particles that are polymer-enclosed and, therefore, not significantly agglomerated. For purposes of the present invention, average particle size can be measured according to known laser scattering techniques. For example, average particle size can be determined using a Horiba Model LA 900 laser diffraction particle size instrument, which uses a helium-neon laser with a wave length of 633 nm to measure the size of the particles and assumes the particle has a spherical shape, i.e., the “particle size” refers to the smallest sphere that will completely enclose the particle. Average particle size can also be determined by visually examining an electron micrograph of a transmission electron microscopy (“TEM”) image of a representative sample of the particles, measuring the diameter of the particles in the image, and calculating the average primary particle size of the measured particles based on magnification of the TEM image. One of ordinary skill in the art will understand how to prepare such a TEM image and determine the primary particle size based on the magnification. The primary particle size of a particle refers to the smallest diameter sphere that will completely enclose the particle. As used herein, the term “primary particle size” refers to the size of an individual particle. The shape (or morphology) of the polymer-enclosed color-imparting particles can vary. For example, generally spherical morphologies (such as solid beads, microbeads, or hollow spheres), can be used, as well as particles that are cubic, platy, or acicular (elongated or fibrous). Additionally, the particles can have an internal structure that is hollow, porous or void free, or a combination of any of the foregoing, e.g., a hollow center with porous or solid walls. For more information on suitable particle characteristics see H. Katz et al. (Ed. ), Handbook of Fillers and Plastics (1987) at pages 9-10. Depending on the desired properties and characteristics of the resultant powder coating composition (e.g., coating hardness, scratch resistance, stability, or color), mixtures of one or more polymer-enclosed color-imparting particles having different average particle sizes can be employed. The polymer-enclosed color-imparting particles, such as nanoparticles, can be formed from polymeric and/or non-polymeric inorganic materials, polymeric and/or non-polymeric organic materials, composite materials, as well as mixtures of any of the foregoing. As used herein, “formed from” denotes open, e.g., “comprising,” claim language. As such, it is intended that a composition or substance “formed from” a list of recited components be a composition comprising at least these recited components, and can further comprise other, non-recited components, during the composition's formation. Additionally, as used herein, the term “polymer” is meant to encompass oligomers, and includes without limitation both homopolymers and copolymers. The particles can comprise, for example, a core of essentially a single inorganic oxide, such as silica in colloidal, fumed, or amorphous form, alumina or colloidal alumina, titanium dioxide, iron oxide, cesium oxide, yttrium oxide, colloidal yttria, zirconia, e.g., colloidal or amorphous zirconia, and mixtures of any of the foregoing; or an inorganic oxide of one type upon which is deposited an organic oxide of another type. In certain embodiments, the particles can be selected from fumed silica, amorphous silica, colloidal silica, alumina, colloidal alumina, titanium dioxide, iron oxide, cesium oxide, yttrium oxide, colloidal yttria, zirconia, colloidal zirconia, and mixtures of any of the foregoing. In certain embodiments, the particles comprise colloidal silica. As disclosed above, these materials can be surface treated or untreated. Other useful particles include surface-modified silicas, such as are described in U.S. Pat. No. 5,853,809 at column 6, line 51 to column 8, line 43, incorporated herein by reference. The particles used in the present invention can be formed from inorganic polymeric materials. Non-limiting examples of useful inorganic polymeric materials include polyphosphazenes, polysilanes, polysiloxanes, polygernanes, polymeric sulfur, polymeric selenium, silicones and mixtures of any of the foregoing. A specific, non-limiting example of a particle formed from an inorganic polymeric material suitable for use in the present invention is Tospearl, which is a particle formed from cross-linked siloxanes and is commercially available from Toshiba Silicones Company, Ltd. of Japan. In certain embodiments, the particles used in the present invention comprise an organic pigment, for example, azo compounds (monoazo, di-azo, β-Naphthol, Naphthol AS salt type azo pigment lakes, benzimidazolone, di-azo condensation, isoindolinone, isoindoline), and polycyclic (phthalocyanine, quinacridone, perylene, perinone, diketopyrrolo pyrrole, thioindigo, anthraquinone, indanthrone, anthrapyrimidine, flavanthrone, pyranthrone, anthanthrone, dioxazine, triarylcarbonium, quinophthalone) pigments, and mixtures of any of the foregoing. In certain embodiments, the organic material is selected from perylenes, quinacridones, phthalocyanines, isoindolines, dioxazines (that is, triphenedioxazines), 1,4-diketopyrrolopyrroles, anthrapyrimidines, anthanthrones, flavanthrones, indanthrones, perinones, pyranthrones, thioindigos, 4,4′-diamino-1,1′-dianthraquinonyl, as well as substituted derivatives thereof, and mixtures thereof. Perylene pigments used in the practice of the present invention may be unsubstituted or substituted. Substituted perylenes may be substituted at imide nitrogen atoms for example, and substituents may include an alkyl group of 1 to 10 carbon atoms, an alkoxy group of 1 to 10 carbon atoms and a halogen (such as chlorine) or combinations thereof. Substituted perylenes may contain more than one of any one substituent. The diimides and dianhydrides of perylene-3,4,9,10-tetracarboxylic acid are preferred. Crude perylenes can be prepared by methods known in the art. Phthalocyanine pigments, especially metal phthalocyanines may be used. Although copper phthalocyanines are more readily available, other metal-containing phthalocyanine pigments, such as those based on zinc, cobalt, iron, nickel, and other such metals, may also be used. Metal-free phthalocyanines are also suitable. Phthalocyanine pigments may be unsubstituted or partially substituted, for example, with one or more alkyl (having 1 to 10 carbon atoms), alkoxy (having 1 to 10 carbon atoms), halogens such as chlorine, or other substituents typical of phthalocyanine pigments. Phthalocyanines may be prepared by any of several methods known in the art. They are typically prepared by a reaction of phthalic anhydride, phthalonitrile, or derivatives thereof, with a metal donor, a nitrogen donor (such as urea or the phthalonitrile itself), and an optional catalyst, preferably in an organic solvent. Quinacridone pigments, as used herein, include unsubstituted or substituted quinacridones (for example, with one or more alkyl, alkoxy, halogens such as chlorine, or other substituents typical of quinacridone pigments), and are suitable for the practice of the present invention. The quinacridone pigments may be prepared by any of several methods known in the art but are preferably prepared by thermally ring-closing various 2,5-dianilinoterephthalic acid precursors in the presence of polyphosphoric acid. In certain embodiments, the polymer-enclosed color-imparting particles present in the first powder coating composition and/or the second powder coating composition are formed from an aqueous dispersion of polymer-enclosed color-imparting particles. As used herein, the term “dispersion” refers to a two-phase system in which one phase includes finely divided particles distributed throughout a second phase, which is a continuous phase. The dispersions often are oil-in-water emulsions, wherein an aqueous medium provides the continuous phase of the dispersion in which the polymer-enclosed particles are suspended as the organic phase. The polymer-enclosed color-imparting particles used in the present invention may comprise, for example, a polymer selected from acrylic polymers, polyurethane polymers, polyester polymers, polyether polymers, silicon-based polymers, co-polymers thereof, and mixtures thereof. Such polymers can be produced by any suitable method known to those skilled in the art to which the present invention pertains. Suitable polymer include those disclosed in U.S. patent application Ser. No. 10/876,031 at  to , the cited portion of which being incorporated by reference herein, and United States Patent Application Publication No. 2005/0287348 A1 at  to , the cited portion of which being incorporation by reference herein. In certain embodiments, such aqueous dispersions comprise color-imparting particles enclosed by a friable polymer. As used herein, the term “friable polymer” refers to a polymer that is easily pulverized at ambient conditions. That is, upon removal of liquid materials from the dispersion, the resulting solid material does not coalesce and is easily broken into small fragments or pieces, such as would be suitable as a dry feed material to an extruder to produce a powder coating composition. A film-forming polymer, on the other hand, would, upon removal of liquid materials from the dispersion, form a self-supporting continuous film on at least a horizontal surface of a substrate. As used herein, the term “ambient conditions” refers to refers to surrounding conditions, which is often around one atmosphere of pressure, 50% relative humidity, and 25° C.
has functional groups that are capable of being polymerized to form a larger polymer, and wherein R1 is an alkyl, cycloalkyl or oxyalkyl moiety, R2 is an alkyl or cycloalkyl moiety, and R3 is alkyl, cycloalkyl, arakyl, or aromatic moiety. In certain embodiments, the polymerizable polyester polyurethane comprises a polyester polyurethane having terminal ethylenic unsaturation. As used herein, the phrase “terminal ethylenic unsaturation” means that at least some of the terminal ends of the polyester polyurethane contain a functional group containing ethylenic unsaturation. Such polyester polyurethanes may also include, but need not necessarily include, internal ethylenic unsaturation. As a result, in certain embodiments, the aqueous dispersion comprises a polymerizable polyester polyurethane having terminal ethylenic unsaturation which is prepared from reactants comprising (a) a polyisocyanate, (b) a polyester polyol, and (c) a material comprising an ethylenically unsaturated group and an active hydrogen group. In certain embodiments, the polymerizable polyester polyurethane is formed from reactants further comprising (d) a polyamine, and/or (e) a material comprising an acid functional group or anhydride and a functional group reactive with isocyanate or hydroxyl groups. As used herein, the term “active-hydrogen group” refers to functional groups that are reactive with isocyanates as determined by the Zerewitnoff test as described in the JOURNAL OF THE AMERICAN CHEMICAL SOClETY, Vol. 49, page 3181 (1927). Polyisocyanates suitable for use in preparing the polymerizable polyester polyurethane include aliphatical, cycloaliphatical, araliphatical, and/or aromatic isocyanates, and mixtures thereof. Examples of useful aliphatic and cycloaliphatic polyisocyanates include 4,4-methylenebisdicyclohexyl diisocyanate (hydrogenated MDI), hexamethylene diisocyanate (HDI), isophorone diisocyanate (IPDI), methylenebis(cyclohexyl isocyanate), trimethyl hexamethylene diisocyanate (TMDI), meta-tetramethylxylylene diisocyanate (TMXDI), and cyclohexylene diisocyanate (hydrogenated XDI). Other aliphatic polyisocyanates include isocyanurates of IPDI and HDI. Examples of suitable aromatic polyisocyanates include tolylene diisocyanate (TDI) (i.e., 2,4-tolylene diisocyanate, 2,6-tolylene diisocyanate or a mixture thereof), diphenylmethane-4,4-diisocyanate (MDI), naphthalene-1,5-diisocyanate (NDI), 3,3-dimethyl-4,4-biphenylene diisocyanate (TODI), crude TDI (i.e., a mixture of TDI and an oligomer thereof), polymethylenepolyphenyl polyisocyanate, crude MDI (i.e., a mixture of MDI and an oligomer thereof), xylylene diisocyanate (XDI) and phenylene diisocyanate. Polyisocyanate derivatives prepared from hexamethylene diisocyanate, 1-isocyanato-3,3,5-trimethyl-5-isocyanatomethylcyclohexane (“IPDI”), including isocyanurates thereof, and/or 4,4′-bis(isocyanatocyclohexyl)methane are suitable. In certain embodiments, the amount of polyisocyanate used to prepare the polymerizable polyester polyurethane ranges from 20 to 70 percent by weight, such as 30 to 60 percent by weight or, in some cases, 40 to 50 percent by weight, with the weight percents being based on the total weight of resin solids used to prepare the polymerizable polyester polyurethane. Polyester polyols suitable for use in preparing the polymerizable polyester polyurethane may be prepared by any suitable method, e.g., using saturated dicarboxylic acids or anhydrides thereof (or combination of acids and anhydrides) and polyhydric alcohols, or by ring opening of caprolactones, e.g., epsilon caprolactone. Such polyester polyols are commercially available in various molecular weights. Aliphatic dicarboxylic acids suitable for preparing polyesters include those containing from 4 to 14, such as 6 to 10, carbon atoms inclusive. Examples of such dicarboxylic acids include: succinic acid, glutaric acid, adipic acid, pimelic acid, suberic acid, azelaic aid and sebacic acid. Corresponding anhydrides can also be used. Typically, adipic and azelaic acids are used. Polyhydric alcohols used in the preparation of polyester polyols suitable for use in preparing the polymerizable polyester polyurethane include, without limitation, aliphatic alcohols containing at least 2 hydroxy groups, e.g., straight chain glycols containing from 2 to 15, such as 4 to 8, carbon atoms inclusive. In certain embodiments, the glycols contain hydroxyl groups in the terminal positions. Non-limiting examples of such polyhydric alcohols include ethylene glycol, diethylene glycol, triethylene glycol, tetraethylene glycol, 1,3-propane diol, 1,3-butane diol, 1,4-butane diol, 1,5-pentane diol, 2,2-dimethylpropane diol, 1,5-hexane diol, 1,7-heptane diol, 1,8-octane diol, 1,10-decane diol and mixtures of such polyhydric alcohols. In certain embodiments, the polyester polyol is prepared by reacting a dicarboxylic acid (or anhydride thereof) with a polyhydric alcohol in the presence of an esterification catalyst, such as an organo tin catalyst. The amount of acid and alcohol used will vary and depend on the molecular weight polyester desired. Hydroxy terminated polyesters are obtained by utilizing an excess of the alcohol, thereby to obtain linear chains containing a preponderance of terminal hydroxyl groups. Examples of polyesters include: poly(1,4-butylene adipate), poly(1,4-butylene succinate), poly(1,4-butylene glutarate), poly(1,4-butylene pimelate), poly(1,4-butylene suberate), poly(1,4-butylene azelate), poly(1,4butylene sebacate) and poly(epsilon caprolactone). In certain embodiments, the polyester polyol utilized in preparing the friable, polymerizable polyester polyurethane has a weight average molecular weight from 500 to 3000, such as 500 to 2500, or, in some cases, 900 to about 1300. In certain embodiments, the amount of polyester polyol used to prepare the polymerizable polyester polyurethane included in certain embodiments of the present invention ranges from 10 to 60 percent by weight, such as 20 to 50 percent by weight or, in some cases, 30 to 40 percent by weight, with the weight percents being based on the total weight of resin solids used to prepare the polymerizable polyester polyurethane. As indicated, the polymerizable polyester polyurethane present in certain embodiments of the present invention is formed from a material comprising an ethylenically unsaturated group and an active hydrogen group. Suitable ethylenically unsaturated groups include, for example, acrylates, methacrylates, allyl carbamates, and allyl carbonates. The acrylate and methacrylate functional groups may be represented by the formula, CH2═C(R1)C(O)O—, wherein R1 is hydrogen or methyl. The allyl carbamates and carbonates may be represented by the formulae, CH2═CH—CH2—NH—C(O)O—, and CH2═CH—CH2—O—(O)O—, respectively. In certain embodiments, the material comprising an ethylenically unsaturated group and an active hydrogen group utilized in preparing the polymerizable polyester polyurethane comprises a hydroxyalkyl(meth)acrylate. Suitable hydroxyalkyl (meth)acrylates include those having from 1 to 18 carbon atoms in the alkyl radical, the alkyl radical being substituted or unsubstituted. Specific non-limiting examples of such materials include 2-hydroxyethyl(meth)acrylate, 2-hydroxypropyl(meth)acrylate, 2-hydroxybutyl(meth)acrylate, hexane-1,6-diol mono(meth)acrylate, 4-hydroxybutyl (meth)acrylate, and mixtures thereof. As used herein, the term “(meth)acrylate” is meant to include both acrylates and methacrylates. In certain embodiments, the amount of the material comprising an ethylenically unsaturated group and an active hydrogen group used to prepare the polymerizable polyester polyurethane ranges from 1 to 12 percent by weight, such as 2 to 8 percent by weight or, in some cases, 4 to 6 percent by weight, with the weight percents being based on the total weight of resin solids used to prepare the polymerizable polyester polyurethane. 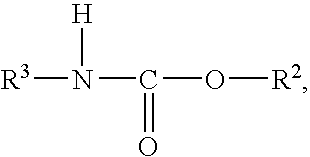 As previously indicated, in certain embodiments, the polymerizable polyester polyurethane is formed from a polyamine. Useful polyamines include, but are not limited to, primary or secondary diamines or polyamines in which the groups attached to the nitrogen atoms can be saturated or unsaturated, aliphatic, alicyclic, aromatic, aromatic-substituted-aliphatic, aliphatic-substituted-aromatic and heterocyclic. Exemplary suitable aliphatic and alicyclic diamines include 1,2-ethylene diamine, 1,2-porphylene diamine, 1,8-octane diamine, isophorone diamine, propane-2,2-cyclohexyl amine, and the like. Exemplary suitable aromatic diamines include phenylene diamines and the toluene diamines, for example, o-phenylene diamine and p-tolylene diamine. These and other suitable polyamines are described in detail in U.S. Pat. No. 4,046,729 at column 6, line 61 to column 7, line 26, the cited portion of which being incorporated herein by reference. In certain embodiments, the amount of polyamine used to prepare the polymerizable polyester polyurethane ranges from 0.5 to 5 percent by weight, such as 1 to 4 percent by weight or, in some cases, 2 to 3 percent by weight, with the weight percents being based on the total weight of resin solids used to prepare the polymerizable polyester polyurethane. wherein X is OH, SH, NH2, or NHR, and R includes alkyl, aryl, cycloalkyl, substituted alkyl, substituted aryl, and substituted cycloalkyl groups, and mixtures thereof; Y includes alkyl, aryl, cycloalkyl, substituted alkyl, substituted aryl, and substituted cycloalkyl groups, and mixtures thereof; and Z includes OSO3H, COOH, OPO3H2, SO2OH, POOH, and PO3H2, and mixtures thereof. Examples of suitable acid functional materials include hydroxypivalic acid, 3-hydroxy butyric acid, D,L-tropic acid, D,L hydroxy malonic acid, D,L-malic acid, citric acid, thioglycolic acid, glycolic acid, amino acid, 12-hydroxy stearic acid, dimethylol propionic acid, mercapto propionic acid, mercapto butyric acid, mercapto-succinic acid, and mixtures thereof. Useful anhydrides include aliphatic, cycloaliphatic, olefinic, cycloolefinic and aromatic anhydrides. Substituted aliphatic and aromatic anhydrides also are useful provided the substituents do not adversely affect the reactivity of the anhydride or the properties of the resultant polyurethane. Examples of substituents include chloro, alkyl and alkoxy. Examples of anhydrides include succinic anhydride, methylsuccinic anhydride, dodecenyl succinic anhydride, octadecenylsuccinic anhydride, phthalic anhydride, tetrahydrophthalic anhydride, methyltetrahydrophthalic anhydride, hexahydrophthalic anhydride, alkyl hexahydrophthalic anhydrides such as methylhexahydrophthalic anhydride, tetrachlorophthalic anhydride, endomethylene tetrahydrophthalic anhydride, trimellitic anhydride, chlorendic anhydride, itaconic anhydride, citraconic anhydride, maleic anhydride, and mixtures thereof. In certain embodiments, the acid functional material or anhydride provides the polymerizable polyester polyurethane with anionic ionizable groups which can be ionized for solubilizing the polymer in water. As a result, in certain embodiments, the polymerizable polyester polyurethane is water-dispersible. As used herein, the term “water-dispersible” means that a material may be dispersed in water without the aid or use of a surfactant. As used herein, the term “ionizable” means a group capable of becoming ionic, i.e., capable of dissociating into ions or becoming electrically charged. An acid may be neutralized with base to from a carboxylate salt group. Examples of anionic groups include —OSO3 −, —COO−, —OPO3 =, —SO2O, —POO−; and PO3 =. In certain embodiments, the amount of the material comprising an acid functional group or anhydride and a functional group reactive with isocyanate or hydroxyl groups used to prepare the polymerizable polyester polyurethane ranges from 5 to 20 percent by weight, such as 7 to 15 percent by weight or, in some cases, 8 to 12 percent by weight, with the weight percents being based on the total weight of resin solids used to prepare the polymerizable polyester polyurethane. As indicated, in certain embodiments, the acid groups are neutralized with a base. Neutralization can range from 0.6 to 1.1, such as 0.4 to 0.9, or, in some cases, 0.8 to 1.0, of the total theoretical neutralization equivalent. Suitable neutralizing agents include inorganic and organic bases such as sodium hydroxide, potassium hydroxide, ammonia, amines, alcohol amines having at least one primary, secondary, or tertiary amino group and at least one hydroxyl group. Suitable amines include alkanolamines such as monoethanolamine, diethanolamine, dimethylaminoethanol, diisopropanolamine, and the like. The polymerizable polyester polyurethane present in certain embodiments of the present invention may be formed by combining the above-identified components in any suitable arrangement. For example, the polymerizable polyester polyurethane may be prepared by solution polymerization techniques understood by those skilled in the art to which the present invention pertains. As should be apparent from the foregoing description, the polymerizable polyester polyurethane can be nonionic, anionic or cationic. In certain embodiments, the polymerizable polyester polyurethane will have a weight average molecular weight of less than 150,000 grams per mole, such as from 10,000 to 100,000 grams per mole, or, in some cases, from 40,000 to 80,000 grams per mole. The molecular weight of the polyurethane and any other polymeric materials described herein is determined by gel permeation chromatography using a polystyrene standard. As previously indicated, in certain embodiments of the present invention, a friable polymer is present that comprises the reaction product of (i) a polymerizable polyester polyurethane, such as that previously described, and (ii) an ethylenically unsaturated monomer. Suitable ethylenically unsaturated monomers include any of the polymerizable ethylenically, unsaturated monomers, including vinyl monomers known in the art. Non-limiting examples of useful ethylenically unsaturated carboxylic acid functional group-containing monomers include (meth)acrylic acid, beta-carboxyethyl acrylate, acryloxypropionic acid, crotonic acid, fumaric acid, monoalkyl esters of fumaric acid, maleic acid, monoalkyl esters of maleic acid, itaconic acid, monoalkyl esters of itaconic acid and mixtures thereof. As used herein, “(meth)acrylic” and terms derived therefrom are intended to include both acrylic and methacrylic. Non-limiting examples of other useful ethylenically unsaturated monomers free of carboxylic acid functional groups include alkyl esters of (meth)acrylic acids, for example, ethyl(meth)acrylate, methyl(meth)acrylate, butyl(meth)acrylate, 2-ethylhexyl(meth)acrylate, 2-hydroxyethyl(meth)acrylate, hydroxypropyl (meth)acrylate, hydroxy butyl(meth)acrylate, isobornyl(meth)acrylate, lauryl (meth)acrylate, and ethylene glycol di(meth)acrylate; vinyl aromatics such as styrene and vinyl toluene; (meth)acrylamides such as N-butoxymethyl acrylamide; acrylonitriles; dialkyl esters of maleic and fumaric acids; vinyl and vinylidene halides; vinyl acetate; vinyl ethers; allyl ethers; allyl alcohols; derivatives thereof and mixtures thereof. The ethylenically unsaturated monomers also can include ethylenically unsaturated, beta-hydroxy ester functional monomers, such as those derived from the reaction of an ethylenically unsaturated acid functional monomer, such as a monocarboxylic acid, for example, acrylic acid, and an epoxy compound which does not participate in the free radical initiated polymerization with the unsaturated acid monomer. Examples of such epoxy compounds are glycidyl ethers and esters. Suitable glycidyl ethers include glycidyl ethers of alcohols and phenols such as butyl glycidyl ether, octyl glycidyl ether, phenyl glycidyl ether and the like. In certain embodiments, the polymerizable polyester polyurethane and the ethylenically unsaturated monomer are present in the aqueous dispersion in a weight ratio of 95:5 to 30:70, such as 90:10 to 40:60, or, in some cases, from 80:20 to 60:40. The aqueous dispersions described herein can be prepared by any of a variety of methods. For example, in certain embodiments, the aqueous dispersion is prepared by a method comprising (A) providing a mixture, in an aqueous medium, of (i) color-imparting particles, (ii) one or more polymerizable, ethylenically unsaturated monomers; and/or (iii) a mixture of one or more polymerizable unsaturated monomers with one or more polymers; and/or (iv) one or more polymers, and then subjecting the mixture to high stress shear conditions in the presence of an aqueous medium. Such methods are described in detail in U.S. patent application Ser. No. 10/876,031 at  to , the cited portion of which being incorporated by reference herein, and United States Patent Application Publication No. 2005/0287348 A1 at  to , the cited portion of which being incorporation by reference herein. In certain embodiments, however, the aqueous dispersions are made by a method comprising (1) providing a mixture, in an aqueous medium, of (i) color-imparting particles, (ii) a polymerizable ethylenically unsaturated monomer, and (iii) a water-dispersible polymerizable dispersant, and (2) polymerizing the ethylenically unsaturated monomer and polymerizable dispersant to form polymer-enclosed color-imparting particles comprising a water-dispersible polymer. In these embodiments, the polymerizable dispersant may comprise any polymerizable material that is water-dispersible and which, upon polymerization with the ethylenically unsaturated monomer, produces polymer-enclosed color-imparting particles comprising a water-dispersible polymer, in some cases, a water-dispersible, friable polymer. In certain embodiments, the polymerizable dispersant comprises the previously described water-dispersible, polymerizable polyester polyurethane having terminal ethylenic unsaturation. In these embodiments, the water-dispersible polymerizable dispersant is capable is dispersing itself and other materials, including the ethylenically unsaturated monomers, in the aqueous medium without the need for surfactants and/or high shear conditions. As a result, the foregoing method for making an aqueous dispersion of polymer-enclosed color-imparting particles is particularly suitable in situations where use of the high stress shear conditions described in U.S. patent application Ser. No. 10/876,031, at  to  and United States Patent Application Publication No. 2005/0287348 A1 at  is not desired or feasible. Therefore, in certain embodiments, the aqueous dispersion of polymer-enclosed color-imparting particles is prepared by a method that does not include the step of subjecting the mixture of color-imparting particles, polymerizable ethylenically unsaturated monomer, and water-dispersible polymerizable dispersant to high stress shear conditions. In addition, the foregoing method enables the formation of nanoparticles in situ, rather than requiring their formation prior to the preparation of the aqueous dispersion. In these methods, particles having a primary particle size of 1 micron or more, after being mixed with the ethylenically unsaturated monomer and the water-dispersible polymerizable dispersant in the aqueous medium, may be formed into color-imparting nanoparticles (i.e., the nanoparticles are formed in situ). In certain embodiments, the color-imparting nanoparticles are formed by subjecting the aqueous medium to pulverizing conditions. For example, the particles can be milled with milling media having a particle size of less than 0.5 millimeters, or less than 0.3 millimeters, or, in some cases, less than 0.1 millimeters. In these embodiments, the color-imparting particles can be milled to nanoparticle size in a high energy mill in the presence of the aqueous medium, the polymerizable ethylenically unsaturated monomer, and the water-dispersible polymerizable dispersant. If desired, another dispersant can be used, such as SOLSPERSE 27000, available from Avecia, Inc.
As indicated, the foregoing methods for making aqueous dispersions of polymer-enclosed color-imparting particles include the step of polymerizing the ethylenically unsaturated monomer and polymerizable dispersant to form polymer-enclosed color-imparting particles comprising a water-dispersible polymer. In certain embodiments, at least a portion of the polymerization occurs during formation of nanoparticles, if applicable. Also, a free radical initiator may be used. Both water and oil soluble initiators can be used. In certain embodiments, the dispersed polymer-enclosed particles have a maximum haze of 10%, or, in some cases, a maximum haze of 5%, or, in yet other cases, a maximum haze of 1%, or, in other embodiments, a maximum haze of 0.5%. As used herein, “haze” is determined by ASTM D1003. The haze values for the polymer-enclosed particles described herein are determined by first having the particles, such as nanoparticles, dispersed in a liquid (such as water, organic solvent, and/or a dispersant, as described herein) and then measuring these dispersions diluted in a solvent, for example, butyl acetate, using a Byk-Gardner TCS (The Color Sphere) instrument having a 500 micron cell path length. Because the % haze of a liquid sample is concentration dependent, the % haze as used herein is reported at a transmittance of about 15% to about 20% at the wavelength of maximum absorbance. An acceptable haze may be achieved for relatively large particles when the difference in refractive index between the particles and the surrounding medium is low. Conversely, for smaller particles, greater refractive index differences between the particle and the surrounding medium may provide an acceptable haze. In certain embodiments, particularly wherein the polymer-enclosed particles comprise a friable polymer, the aqueous dispersion of polymer-enclosed color-imparting particles may then be further processed by (1) removing water from the aqueous dispersion to form a solid material comprising the polymer-enclosed color-imparting particles, and (2) fragmenting the solid material. In these embodiments, the water can be removed from the aqueous dispersion by any suitable drying method, such as through the use of a drum dryer, a roller dryer, a spray dryer, or the like. Moreover, the solid material can be fragmented by any suitable technique, such as through the use of a hammer mill or the like. Following fragmentation, the resultant granules may be further processed, such as by being screened in a classifier, before packaging. In the present invention, the polymer-enclosed color-imparting particles are incorporated into a powder coating composition. In addition to the polymer-enclosed particles, such powder coating compositions may comprise a particulate film-forming resin. Suitable film-forming resins include, for example, an epoxy resin, such as an epoxy group-containing acrylic polymer or a polyglycidyl ether of a polyhydric alcohol and a suitable curing agent for the epoxy resin, such as a polyfunctional carboxylic acid group-containing material or a dicyanamide. Examples of curable particulate resinous materials are described in U.S. Pat. No. RE 32,261 and U.S. Pat. No. 4,804,581, incorporated by reference herein. Examples of other suitable particulate film-forming resins are carboxylic acid functional resins, such as carboxylic acid functional polyesters and acrylic polymers and suitable curing agents for such materials, such as triglycidyl isocyanurate and beta-hydroxyalkylamide curing agents as described, for example, in U.S. Pat. No. 4,801,680 and U.S. Pat. No. 4,988,767, incorporated by reference herein. In certain embodiments, such powder coating compositions comprise from 50 to 90 percent by weight, such as 60 to 80 percent by weight, of the particulate film-forming resin, based on the total weight of the powder coating composition. In certain embodiments, such powder coating compositions comprise from 0.1 to 50 percent by weight, such as 1 to 20 percent by weight, of polymer-enclosed particles, based on the total weight of the powder coating composition. These powder coating compositions can optionally include other materials such as other pigments, fillers, light stabilizers, flow modifiers, anti-popping agents, and anti-oxidants. Suitable pigments include, for example, titanium dioxide, ultramarine blue, phthalocyanine blue, phthalocyanine green, carbon black, graphite fibrils, black iron oxide, chromium green oxide, ferride yellow and quindo red. Anti-popping agents can be added to the composition to allow any volatile material to escape from the film during baking. Benzoin is a commonly preferred anti-popping agent and when used is generally present in amounts of from 0.5 to 3.0 percent by weight based on total weight of the powder coating composition. Such powder coating compositions may also include fumed silica or the like to reduce caking of the powder during storage. An example of a fumed silica is sold by Cabot Corporation under the trademark CAB-O-SIL. The fumed silica is present in amounts ranging from 0.1 to 1 percent by weight based on total weight of the powder coating formulation. The polymer-enclosed color-imparting particles may be incorporated into the powder coating composition by any of a variety of methods. For example, in embodiments wherein the polymer-enclosed particles comprise a friable polymer, the polymer-enclosed color-imparting particles and other coating components are all embodied in a dried, particulate form, blended together, and then melt blended in an extruder. In other embodiments, however, such as those cases wherein an aqueous dispersion of polymer-enclosed particles is used that does not comprise a friable polymer, the polymer-enclosed color-imparting particles are incorporated into the powder coating composition by a method comprising (1) introducing to an extruder powder coating composition components comprising: (a) an aqueous dispersion of polymer-enclosed color-imparting particles, and (b) dry materials; (2) blending (a) and (b) in the extruder; (3) devolatilizing the blend to form an extrudate; (4) cooling the extrudate, and (5) milling the extrudate to a desired particle size. As used herein, the term “devolatilizing” means to remove volatile materials, including water and organic solvents. In certain embodiments, such powder coating compositions are made by a method and/or apparatus described in United States Patent Application Publication Nos. 2005/0212159A1; 2005/0212171A1; and/or 2005/0213423A1, the relevant disclosures of which being incorporated herein by reference. In the foregoing methods, the dry materials may include the particulate film-forming resin described earlier as well as any other composition additives. The dry materials may be first blending in a high shear mixer such as a planetary mixture. In certain embodiments, the dry materials and the aqueous dispersion of the present invention are then blended in an extruder at a temperature ranging from 80° C. to 150° C. The extrudate is then cooled and pulverized into a particulate blend. In accordance with the present invention, the powder coating composition comprising polymer-enclosed color-imparting particles is mixed with another powder coating composition, which may, and often does, also include polymer-enclosed color-imparting particles, to form a powder coating composition of the present invention. In addition to the polymer-enclosed color-imparting particles, such powder coating compositions may comprise a particulate film-forming resin, such as those described earlier. In certain embodiments, the film-forming resin present in the first powder coating composition is the same as, or at least compatible with, the film-forming resin present in the second coating composition. As indicated earlier, the mixture of the first powder coating with the second powder coating composition produces a powder coating composition of the present invention that, upon direct application to at least a portion of a substrate and cure, produces a decorative and durable coating having a homogeneous hue different from the hue of the powder coating compositions from which it is formed. In other words, the powder coating compositions of the present invention are capable of producing a decorative and durable coating having a homogeneous hue different from the first hue and the second hue. As used herein, the term “direct application”, and the like, means that the powder coating composition need not be subject to the Extrusion Process prior to application. As used herein, the term “homogeneous hue different from the first hue and the second hue” means that the coating is recognized by a person as having a uniform hue that is different from the first hue and the second hue when viewed with the naked eye at any distance from the coating, including distances of one foot or less. Stated differently, the coating does not have a “salt and pepper” appearance wherein each of the first hue and the second hue is distinguishable by visual examination with the naked eye. As used herein, the term “hue” refers to the quality of a color as determined by its dominant wavelength. The powder coating compositions of the invention can be applied to a variety of substrates including metallic substrates, for example, aluminum and steel substrates. The powder coating compositions are often applied by spraying, and in the case of a metal substrate, by electrostatic spraying, or by the use of a fluidized bed. The powder coating compositions of the present invention can be applied in a single sweep or in several passes to provide a film having a thickness after cure of from about 1 to 10 mils (25 to 250 micrometers), usually about 2 to 4 mils (50 to 100 micrometers). In many cases, after application of the powder coating composition, the coated substrate is heated to a temperature sufficient to cure the coating, often to a temperature ranging from 250° F. to 500° F. (121.1° C. to 260.0° C.) for 1 to 60 minutes, such as 300° F. to 400° F. (148.9° C. to 204.4° C.) for 15 to 30 minutes. As a result, the present invention is also directed to articles, such as metal articles, at least partially coated by a decorative and durable coating having a homogeneous hue. The decorative and durable coating is deposited directly from a powder coating composition comprising a mixture of a first powder coating composition having a first hue and a second powder coating composition having a second hue different from the first hue, wherein the first powder coating composition and/or the second powder coating composition comprises polymer-enclosed color-imparting particles. In the articles of the present invention, the homogeneous hue is different that the first hue and the second hue. In certain embodiments, the decorative and durable coating having a homogeneous hue is also a non-hiding coating. As used herein, the term “non-hiding coating” refers to a coating layer deposited upon a substrate wherein the surface beneath the coating layer is visible to the naked eye. In certain embodiments of the present invention, the surface beneath the non-hiding coating layer is visible when the non-hiding layer is applied at a dry film thickness of 0.5 to 5.0 mils (12.7 to 127 microns). One way to assess non-hiding is by measurement of opacity. As used herein, “opacity” refers to the degree to which a material obscures a substrate. “Percent opacity” refers herein to the ratio of the reflectance of a dry coating film over a black substrate of 5% or less reflectance, to the reflectance of the same coating film, equivalently applied and dried, over a substrate of 85% reflectance. The percent opacity of a dry coating film will depend on the dry film thickness of the coating and the concentration of color-imparting particles. In certain embodiments of the present invention, the color-imparting non-hiding coating layer has a percent opacity of no more than 90 percent, such as no more than 50 percent, at a dry film thickness of one (1) mil (about 25 microns). The powder coating compositions of the present invention may be used to form a single decorative and durable coating, for example, a monocoat, a base coat in a two-layered system or both; or as one or more layers of a multi-layered system including a clear top coating composition, a colorant layer and/or a base coating composition, and/or a primer layer, including, for example, an electrodeposition primer and/or a primer-surfacer layer. The present invention is also directed to substrates at least partially coated with a multi-layer composite coating wherein at least one coating layer is deposited from a powder coating composition of the present invention. In certain embodiments, for example, the powder coating composition of the present invention comprises the basecoat layer in a multi-layer composite coating comprising a basecoat and a topcoat. As a result, in these embodiments, after application and curing of the powder coating composition of the present invention, at least one topcoat layer can be applied to the basecoat layer. The topcoat can, for example, be deposited from a powder coating composition, an organic solvent-based coating composition or a water-based coating composition, as is well known in the art. The film-forming composition of the topcoat can be any of the compositions useful in coatings applications, including, for example, a film-forming composition that comprises a resinous binder selected from acrylic polymers, polyesters, including alkyds, and polyurethanes. The topcoat composition can be applied by any conventional coating technique such as brushing, spraying, dipping or flowing, but they are most often applied by spraying. The usual spray techniques and equipment for air spraying, airless spray and electrostatic spraying in either manual or automatic methods can be used. As should be apparent from the foregoing description, the present invention is also directed to methods for preparing a decorative and durable coating having a homogeneous hue. These methods comprise: (a) providing a first powder coating composition having a first hue, (b) providing a second powder coating composition having a second hue different than the first hue, (c) mixing the first powder coating composition and the second powder coating composition, and (d) directly applying the mixture to at least a portion of a substrate. In these methods, the first powder coating composition and/or the second powder coating composition comprises polymer-enclosed color-imparting particles. In certain embodiments, the present invention is embodied in the form of a kit. As used herein, the term “kit” refers to a collection of articles usable together. In these embodiments, the present invention is directed to a kit comprising: (a) a first container comprising a powder coating composition having a first hue, and (b) a second container comprising a powder coating composition having a second hue different from the first hue. In the kits of the present invention, the first container and/or the second container comprises a powder coating composition comprising polymer-enclosed color-imparting particles, and upon mixture of the contents of the first container with the contents of the second container, a powder coating composition is formed that, upon direct application to at least a portion of a substrate and cure, produces a decorative and durable coating having a homogeneous hue different from the first hue and the second hue. In addition, in certain embodiments, the present invention is directed to a method for producing a coating of a selected hue, i.e., color matching, from a mixture of two or more powder coating compositions. These methods comprise: (a) providing a first powder coating composition having a first hue, (b) providing a second powder coating composition having a second hue different than the first hue, (c) mixing the first powder coating composition and the second powder coating composition in a proportion that results in a coating having the selected hue when the mixture is directly applied to at least a portion of a substrate and cured. In these methods, the first powder coating composition and/or the second powder coating composition comprises polymer-enclosed color-imparting particles. The polyurethane dispersion was prepared in a four neck round bottom flask equipped with an electronic temperature probe, mechanical stirrer, condenser, and a heating mantle. Charge I was stirred 5 minutes in the flask at a temperature of 125° C. Charge II was added and the mixture was cooled to 70° C. Charge III was added over a 10 minute period. Charge IV was added and the resulting mixture was gradually heated to 90° C. over 90 minutes and then held at 90° C. for 1 hour. Charge V was stirred in a separate flask and heated to 60° C. 1387.8 g of the reaction product of Charges I, II, III, and IV was added to Charge V over 10 minutes. Charge VI was added and the resulting mixture was cooled to room temperature. The final product was a translucent emulsion with an acid value of 12.5, a Brookfield viscosity of 3710 centipoise (spindle #5 at 60 rpm), a pH of 7.6, and a nonvolatile content of 29.4% as measured at 110° C. for one hour. 2Commercially available from BASF Corp. The ingredients were mixed using a Ross rotor/stator mixer Model #HSM-100L for 2.5 hours and then recycled through an Advantis V15 Drais mill containing 500 ml of 0.3 mm Zirconox YTZ® grinding media in a one liter grinding chamber. The mixture was milled at 1400 rpm for a total time of 19.0 hours. The progress of the milling was monitored by visually observing changes in the transparency of thin films of samples drawn down over black and white Leneta paper. Charge II was added and the resulting mixture was stirred 5 minutes at 11° C. Charge III was added in two aliquots over 5 minutes. The temperature of the mixture increased to 13° C. The final product was a blue liquid with a Brookfield viscosity of 26 centipoise (spindle #1 at 60 rpm), a pH of 7.2, and a nonvolatile content of 30.0% as measured at 110° C. for one hour. The ingredients were mixed using a Ross rotor/stator mixer Model #HSM-100L for 5.5 hours and then recycled through an Advantis V15 Drais mill containing 500 ml of 0.3 mm Zirconox YTZ® grinding media in a one liter grinding chamber. The mixture was milled at 1400 rpm for a total time of 23 hours. The progress of the milling was monitored by visually observing changes in the transparency of thin films of samples drawn down over black and white Leneta paper. Charge II was added and the resulting mixture was stirred 5 minutes. Charge III was added in two aliquots over 5 minutes. The final product was a yellow liquid with a Brookfield viscosity of 53 centipoise (spindle #1 at 60 rpm), a pH of 7.3, and a nonvolatile content of 28.8% as measured at 110° C. for one hour. Components 1 to 9 were premixed in a Henschel Blender for 1 minute at 1000 RPM. The mixture was then extruded through a Coperion W&P 30 mm co-rotating twin screw extruder at a 340 RPM screw speed and an average torque of 30-40%. The extruder was equipped with a low pressure injection system and five independently temperature controlled zones, as described in United States Published Patent Applications 2005/0213423; 2005/0212159A1; and 2005/0212171A1. The five independently temperature controlled zones were controlled at the following temperatures: Zone 1: 60° C.; Zone 2: 120° C.; Zone 3: 130° C.; Zone 4: 120° C.; Zone 5: 100° C. The extrudate was cooled and ground in a mechanical milling system to a particle size of about 28 to 30 microns. Oversized particles were removed and component 10 was added. Components 1 to 10 were premixed in a Henschel Blender for 1 minute at 1000 RPM. The mixture was then extruded through a Coperion W&P 30 mm co-rotating twin screw extruder at a 340 RPM screw speed and an average torque of 30-40%. The extruder was equipped with a low pressure injection system and five independently temperature controlled zones, as described in United States Published Patent Applications 2005/0213423; 2005/0212159A1; and 2005/0212171A1. The five independently temperature controlled zones were controlled at the following temperatures: Zone 1: 60° C.; Zone 2: 120° C.; Zone 3: 130° C.; Zone 4: 120° C.; Zone 5: 100° C. The extrudate was cooled and ground in a mechanical milling system to a particle size of about 28 to 30 microns. Oversized particles were removed and component 10 was added. A powder coating composition was prepared from the powder coating composition intermediate of Example 4 and the Polyurethane/Nanopigment Dispersion of Example 2. The powder coating composition was prepared using the Coperion W&P 30 mm co-rotating twin screw extruder and conditions described in Example 4 equipped with a low pressure injection system and five independently temperature controlled zones, as described in United States Published Patent Applications 2005/0213423; 2005/0212159A1; and 2005/0212171A1. The powder coating composition intermediate of Example 4 was fed to the extruder at a rate of 280 grams per minute and the pigments dispersions were fed to the extruder at a rate of 105 grams per minute through a low pressure injection system. Zone 4 was equipped with a devolatilization port for volatile vapor removal. The extrudate was cooled and ground in a mechanical milling system to a particle size of about 28 to 30 microns. A powder coating composition was prepared from the powder coating composition intermediate of Example 4 and the Polyurethane/Nanopigment Dispersion of Example 3 using the same apparatus and process conditions described in Example 7. For Example 9a, a 50/50 weight percent combination of the powder coating compositions of Examples 5 and 6 were dry blended in a suitable container by vigorous shaking. The resulting powder coating composition was electrostatically applied to 4″×12″ electrocoated panels. The panels were cured at an appropriate elevated temperature and cooled to ambient temperature. Upon close inspection of the resultant coating at a distance of less than 1 foot, the coating had a “salt and pepper” appearance in which the yellow and blue hue were individually visible. For Example 9a, a 50/50 weight percent combination of the powder coating compositions of Examples 7 and 8 were dry blended in a suitable container by vigorous shaking. The resulting powder coating composition was electrostatically applied to 4″×12″ electrocoated panels. The panels were cured at an appropriate elevated temperature and cooled to ambient temperature. Upon close inspection of the resultant coating at a distance of less than 1 foot, the coating had a homogeneous green hue. (ii) the powder coating composition, upon direct application to at least a portion of a substrate and cure, produces a decorative and durable coating having a homogeneous hue different from the first hue and the second hue. 2. The powder coating composition of claim 1, wherein the first powder coating composition and the second powder coating composition both comprise polymer-enclosed color-imparting particles. 3. The powder coating composition of claim 2, wherein the polymer-enclosed color-imparting particles comprise nanoparticles. 4. The powder coating composition of claim 3, wherein the polymer-enclosed color-imparting particles are formed from an aqueous dispersion of polymer-enclosed color-imparting particles. 5. The powder coating composition of claim 3, wherein the nanoparticles have a maximum haze of 10%. 6. The powder coating composition of claim 3, wherein the nanoparticles comprise organic nanoparticles. 7. The powder coating composition of claim 6, wherein the organic nanoparticles comprise organic pigments selected from perylenes, quinacridones, phthalocyanines, isoindolines, dioxazines (that is, triphenedioxazines), 1,4-diketopyrrolopyrroles, anthrapyrimidines, anthanthrones, flavanthrones, indanthrones, perinones, pyranthrones, thioindigos, 4,4′-diamino-1,1′-dianthraquinonyl, azo compounds, substituted derivatives thereof, and mixtures thereof. 8. The powder coating composition of claim 2 wherein the polymer-enclosed color-imparting particles comprise a friable polymer. 9. The powder coating composition of claim 8, wherein the friable polymer comprises the reaction product of (i) a polymerizable polyester polyurethane, and (ii) an ethylenically unsaturated monomer. 10. The powder coating composition of claim 9, wherein the polymerizable polyester polyurethane comprises a polyester polyurethane having terminal ethylenic unsaturation. (c) a material comprising an ethylenically unsaturated group and an active hydrogen group. 12. The powder coating composition of claim 4, wherein the aqueous dispersion of polymer-enclosed color-imparting particles comprises a polymer that is water-dispersible. 13. The powder coating composition of claim 2, wherein the first powder coating composition and the second powder coating composition further comprise the same film-forming resin. 14. A substrate at least partially coated with a coating deposited from the powder coating composition of claim 2. 15. The substrate of claim 14, wherein the coating is a non-hiding coating. 16. A multi-layer composite coating wherein at least one coating layer is deposited from the powder coating composition of claim 2. (iii) the homogeneous hue is different than the first hue and the second hue. wherein the first powder coating composition and/or the second powder coating composition comprises polymer-enclosed color-imparting particles. (ii) upon mixture of the contents of the first container with the contents of the second container, a powder coating composition is formed that, upon direct application to at least a portion of a substrate and cure, produces a decorative and durable coating having a homogeneous hue different from the first hue and the second hue.